TTI experts will explore how assessments should be used to ensure candidate selection success and employee retention. This event is for TTI Value Added Associates, their customers, potential customers or anyone interested in incorporating assessments into their talent management processes. This Webinar is scheduled for March 25th, 2010 at 3:00pm Central Time. 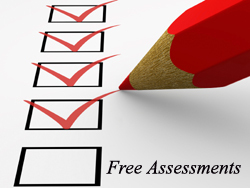 Free Coaching and Assessment till April 30, 2010. If you qualify you can receive a combination Workplace Motivators and Behaviors Assessment with coaching a $500.00 value for free. Contact Ted Gulas at 464-9046 800-239-2910 and results@gulasgroup.com to determine if you qualify. Problem: During his debrief with Sally, Bill shared his frustration in his efforts to reach the decision makers when he was prospecting. Bill was working on two fronts: actual drop in visits and phone calls. Each time Bill reached out, he felt he was blocked by the gatekeepers and information gatherers. It often seemed like there was a conspiracy to keep him from speaking to the top-level people. He had tried various techniques, but nothing was working. To top things off, once he did make contact with the decision makers, he was summarily and quickly dismissed. Diagnosis: Gatekeepers typically feel that an important part of their job is to insulate their boss from unwanted intrusions. Only important people are permitted to have access and salespeople are not considered important. As for the information gatherers, they feel they’ve been assigned an important job. It has two parts. First, they need to get as much information as possible from various vendors so the company can evaluate their options. Second, they’re supposed to keep those pesky salespeople away. These “Seemore’s” according to Anthony Parenello in his book, Selling To Vitto feel they’ve been entrusted with an important job. The Seemore’s want to protect their turf, so some ego is involved here as well. Sally went on to add that all three roles Bill is trying to meet is suffering from what Jill Konrath calls in her recent book SNAP “Frazzled Customer Syndrome” Sally explained. “You do not get to carry on conversations with people to move the selling process forward until you are perceived to be bringing value and can resolve an urgent issue for the person and organization you have targeted,” Sally reminded Bill. “That was what creating a compelling reason tactic was about from the Gulas Group’s DNA Sales Development process we attended.” Sally went on to discuss how your primary intent had better not be to sell somebody something. What a paradox! You get measured by your sales success, but you have to internalize the mindset of not wanting to sell anything. This year you are booking record profits in this economy? Is everyone on your sales team is overachieving? Are you are making more money than you ever dreamed of? Do you currently have 100% market share? Have you ever made a sales hiring mistake? If you follow these suggestions, you’ll have a much better chance of getting in the door to start a dialog with the people you’re trying to reach!